If I ruled the world, every day would not be the first day of Spring, nor would every bird have a new song to sing. But one piece of geography would be put right. California would be a lot closer to London. I have never been much good at competitions, but – were such to exist – I believe that I would have a fair chance of winning two. And the titles engraved on my silver cups would be, ‘The World’s Most Enthusiastic Visitor to America’s West Coast’ and ‘The World’s Least Enthusiastic Airline Passenger’. You will understand, therefore, that it is with some conviction that I say, Thank goodness for the Business Class of United Airlines. For my recent trip to Los Angeles, I arrived at Heathrow Airport full of anxiety. My taxi journey had been uneventful. I had therefore had plenty of time to build up a mountain of worry about the delays I would be facing because of the present levels of airport security. But there was no queue at United’s Business Class check-in at Terminal Three and Peter, a young fellow from Slovakia, dealt with the formalities promptly and efficiently. Soon I was in the Red Carpet Lounge. Now I know that there are some folk who love the hustle and bustle of airport shops and tingle with excitement at the sight of the Duty Free grotto. I am not of their number. Shopping (unless it involves an auction house or a visit to be measured for a new pair of shoes, or a suit or some shirts) I find wearisome. Before a flight I want a comfortable chair, a cup of coffee and a biscuit, and – most of all – some quiet and calm. And all of these I found in the Red Carpet Lounge, which is reserved for Business Class passengers. Here, among restful tones of brown and grey, I sat next to potted palms under gentle spotlights and… relaxed. Once aboard the aeroplane, I was immediately impressed by the amount of legroom. Those of you used to travelling in motor cars of the right sort, will know what I mean when I say that there was as much legroom as you would find in the back of a 1950s Rolls-Royce Silver Wraith limousine, with the jump-seats folded away. 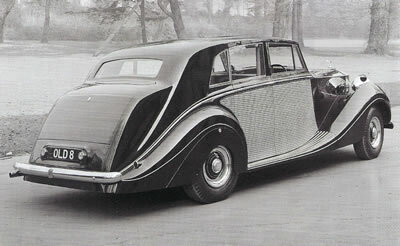 (This is why I reproduce a picture of such a motor car for your edification.) In other words, I could stretch out without fear of inconveniencing the other passengers in any way whatsoever. And, needless to say, there were lots of buttons to press, were I to need the electrical machinery to move me this way or that. Aeroplane cabins can be, aesthetically, rather gloomy, but I found that I soon took to this combination of light and dark greys, enlivened by flecks of red. By the time my charming flight attendant, Jayne Iula, arrived with a dish of warm nuts and a glass of cold champagne (Pol Roger), I was attuned to my surroundings and in a remarkably good mood. Of late I have taken to following all the advice from the experts on long haul flights – particularly those stern admonitions about not drinking alcohol. But this time I decided to follow the wisdom of St Paul and have a little wine “for my health’s sake”. And I was glad I did. The wines on offer on United have been chosen by Master of Wine, Doug Frost. He seems to have done a good job in selecting bottles which stand up to the strange conditions of the pressurized cabin. Bold, clear flavours, balanced with proper acidity, survive best – and these are what I found in the 2005 Van Loveren sauvignon blanc from South Africa. Well-structured and grassy, this was a good wine. And so was the 2002 Lockwood merlot from Monterey, which yielded a nose of ripe damsons and a full taste with suggestions of black cherries. These I drank with lunch. A tablecloth of white damask and a proper napkin had been brought by Jayne, to add to the air of a civilized occasion. Given the inevitable difficulties of catering in the clouds, I judged the food of good quality. Parma ham and mango was served with a separate green salad with a ginger dressing. Then it was fillet of beef (pink in the centre) with a Dijon mustard sauce, broccoli, red peppers, sugar snap peas and sweet potatoes. Shropshire Blue and Cornish Yaag cheeses were followed by the inevitable star of the show: Häagen-Dazs ice cream. I know not why, but ice cream is the only food I know which always tastes wonderful in the air. I asked for, and was given, a second helping. After this healthy repast, the blinds were lowered and the lights dimmed. I think I did manage to drop off now and again, but I was certainly awake for the mid-flight snack, a cheese and ham roll. And I was overjoyed when it was time for afternoon tea, with sandwiches of tuna and chicken and red Leicester cheese and a warm scone with a pot of Frank Cooper’s strawberry jam. And then I was in Los Angeles. My good mood had survived. This was a minor miracle. I would still like the distance between London and California to be drastically reduced. But, until I am made Ruler of the World, my love for the West Coast will oblige me to put up with distance, undertake these long flights and render my thanks to the Business Class of United Airlines.